It’s spring time here at Mary’s Valencia Schoolhouse, and the children are thrilled about our Caterpillars and Butterflies project! After our afternoon nap, the kids and teachers were very excited to discover our first butterfly had finally emerged from it’s cocoon! The children are so very excited and it’s been a wonderful little project, enabling them to learn first hand by witnessing the process for themselves. A short time ago received our tiny little caterpillars in the mail. The caterpillars arrived packaged inside a clear plastic container, which comes with all the nutritious food they need to grow into healthy butterflies. We placed the container up on a shelf and the children were able to watch the caterpillars as they grew. After about ten days, the caterpillars crawled to the top of the container and attached themselves to the lid. They shed their exoskeletons one last time, and turned into chrysalides. After about two days, the chrysalides harden and turn into cocoons. 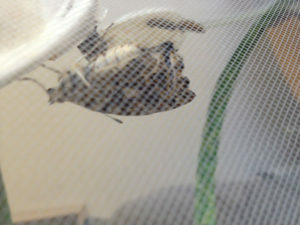 Once fully hardened, we were able to safely relocate the cocoons to their new netted butterfly habitat. After being placed in their new habitat, the children have been watching everyday, waiting for the butterflies to emerge. Finally, our first butterfly arrived today and the kids are soooo excited! Once the rest of the butterflies emerge, the children will have just a few precious days to observe and help care for them before setting them free. Although we explained how the caterpillars would eventually turn into butterflies, I don’t think the kids were really able to grasp the concept. They were just excited to have some “pet” caterpillars! What do Butterflies Eat and How To Care for Them? Butterflies like sweetened sugar water and they sip it through their long proboscises. We just mix 2 tsp. of sugar into a 1/2 cup of water. We place flowers in their habitat and sprinkle sweetened water on the flowers daily. They also like oranges and watermelon. After a few short days, we’ll all set the butterflies free so they can go lay eggs and the process will start over once again. Mary’s Schoolhouse is also known as Gregory Family Child Care. We are a California State Licensed home child care and have been in business for many years. We are passionate about caring for and teaching all preschool age children in a safe and loving home environment. Discover for yourself what a child does during a typical day at our child care. Please contact us should you have any questions or would like more information about our child care. 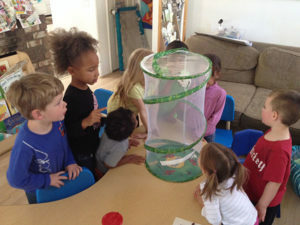 We hope you enjoyed our post, Caterpillars to Butterflies at Mary’s Valencia Schoolhouse. It’s been a fun but simple project and the children are having fun and learning at the same time!